On Thursday, Sergeant Yovel Mor-Yosef, 20 from Ashkelon, and Corporal Yosef Cohen, 19 from Beit Shemesh, were killed during a terror attack at Givat Assaf. Both soldiers served in the Netzach Yehuda-Nahal Battalion and were guarding the hitchhiking post when they were gunned down by the terrorist. Netzach Yehuda is a battalion in the Kfir Brigade that enables haredi soldiers to serve in the IDF. Female soldiers are not deployed on base, and soldiers receive special food that conforms to a stringent halakhic standard of Jewish dietary laws. 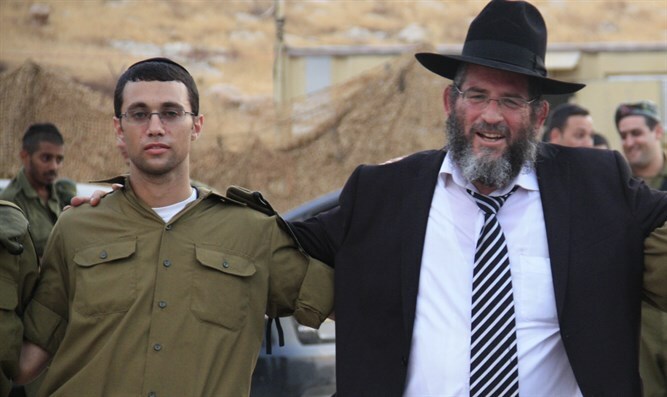 The news that the two were cut down in a hail of gunfire came as a blow to Rabbi David Fuchs, a rabbi responsible for teaching soldiers in the battalion Torah and reinforcing morale. Rabbi Fuchs said that he had seen the two soldiers shortly before the attack and was shocked to hear that Mor-Yosef and Cohen were killed half an hour later. “They were such sweet boys, always wore smiles on their faces. Their friends loved and admired them; they were friends with everyone. I saw them today, just a half-hour before the attack. They were in the midst of guarding the station as I passed by them in my car on my way to deliver Torah lectures in pillboxes, but I didn’t want to stop to avoid disturbing them," said Rabbi Fuchs. "To hear that guys like that, boys who were so full of energy, happy, upbeat, have fallen is indescribably painful. I met now with their friends; everyone is in terrible shock. The anguish causes them to focus now even more intensely on their duties. The residents of the settlement where they fell loved them and shared a close relationship with them,” the rabbi added. Following the attack, Mor-Yosef was posthumously promoted to Staff Sergeant and Corporal Yosef Cohen was posthumously promoted to Sergeant. Their families have been notified. Another IDF soldier and 20-year-old Shira Sabag from Beit El were seriously wounded in the attack as well. The wounded soldier underwent a complicated head operation at Hadassah Hospital. Doctors say that his condition continues to be life-threatening. Shira Sabag, who was seriously wounded, was operated at Shaare Zedek Medical Center and her condition is defined as serious yet stable. Sabag is fully conscious and has already met with her parents.